Just about every digital image requires sharpening since softness is inevitably introduced during the image digitizing process, and oftentimes with digital photography, images are sharpened badly. This second edition of the definitive book by the late Bruce Fraser teaches readers all they need to know about sharpening, including when to use it, why it's needed, how to use the camera's features, how to recognize an image that needs sharpening, how much to use, what's bad sharpening, and how to fix oversharpening. 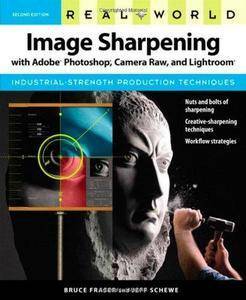 Real World Image Sharpening with Adobe Photoshop, Camera Raw, and Lightroom, Second Edition is written by Fraser's friend and renowned photographer Jeff Schewe. It adds essential coverage of Adobe Photoshop Lightroom and Adobe Camera Raw, since many of the key sharpening functions have migrated from Photoshop to those tools since the first edition of the book was published. The book shows readers how to: recognize the kind of sharpening that each image needs; become acquainted with the full arsenal of sharpening tools built into Photoshop, Lightroom, and Camera Raw; sharpen part of an image selectively; create a complete sharpening workflow that allows sharpening images optimally for different uses; balance the contradictory demands of sharpening and noise reduction; and more.